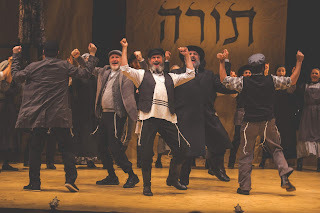 Fiddler on the Roof--The Definitive "Fiddler"
That feeling of exhilaration you experience throughout the wondrous production of “Fiddler on the Roof” presented by the National Yiddish Theatre Folksbiene at the Museum of Jewish Heritage will not leave you as you exit the theater. Down at the Battery where it is playing, you glance over at the Statue of Liberty and Ellis Island and think about not only those residents of Anatevke where the show takes place who plan on leaving Russia to make a new life in America but your own ancestors. The prophetic words in the closing number “Anatevke” resonate with even more realism as the plight of the migrant families comes to life. This might be the fifth production of a classic show that is sheer perfection and yet in its own way this, at least, for me is the definitive production. 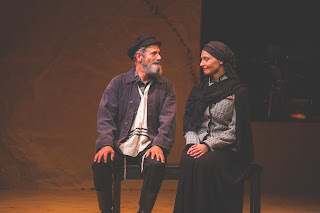 Entirely performed in Yiddish with two screens on sides of the stage projecting English supertitles, it is physically a bare-bones production in terms of sets and scenery though we do have that evocative lighting by Peter Kaczorowski. Chairs and tables along with Tevye's cart are basically the sets. 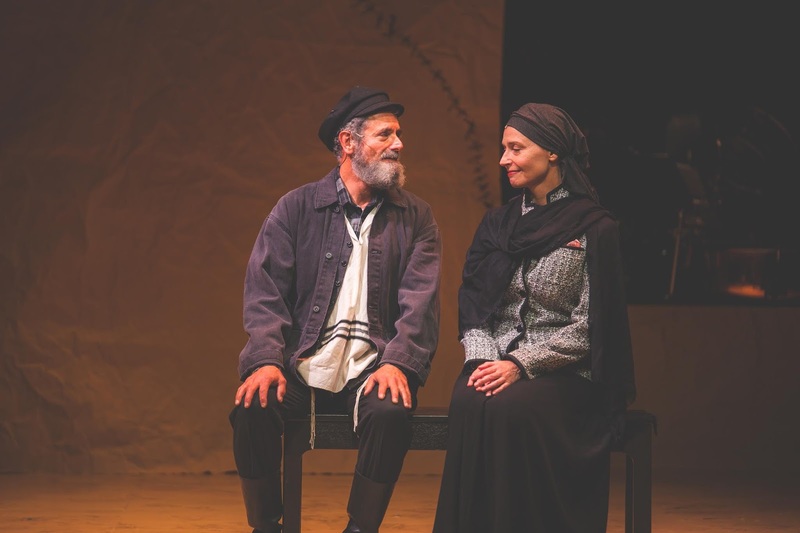 Even when Tevye (a wondrous Steven Skybell) and his lovably strong willed wife Golde (an equally winning Mary Illes) perform the delightful “The Dream” there is no bed to speak of. They are on several chairs and a quilt. And, yes, I do still say this is the best production of the show I have seen. In the delightful film “Meeting Venus” a group of singers perform Wagner’s “Tannhauser” and when a union strike prevents any use of scenery one of the actors makes a comment to the effect that as long as they believe in the material they don’t need sets. That certainly applies in this “Fiddler.” In other productions, and all have been first rate, you felt you were watching a musical. Here I honestly felt that I was in their small town watching the actual inhabitants. From the first chords of the memorable “Tradition” the orchestra of twelve sound (the clarity in the theater is sublime) as if you are listening to a full orchestra. Yes, it sounds that good. 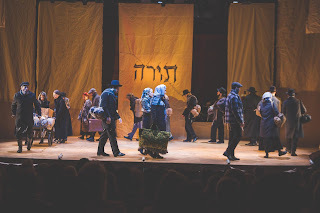 While the show always had its share of hilarious and moving moments here it is performed with such robust dedication (learning Yiddish is enough of a chore) you feel you are watching the show for the first time. Normally, Jackie Hoffman as funny as she can be has a tendency to overdo all her roles but not here. She portrays the loquacious matchmaker Yente as straightforward as it was written. No need for needless antics. Tevye's daughters are beautifully played by Rachel Zatcoff, Stephanie Lynne Mason, Rosie Jo Neddy, Raquel Nobile and Samantha Hahn. Daniel Kahn makes a fiery Pertshik, the radical teacher who falls in love with Hodl. While “Far From the Home I Love” which Hodl sings to her father before leaving to join her husband, Pertshik, in Siberia has always been a pleasingly touching number here Mason imbues the song with more raw emotion than I recall. Ben Liebert is most pleasing as the nebbish tailor Motel doing a more emotionally gratifying version of the always tuneful “Miracle of Miracles.” I don’t recall ever seeing another Motel with tears in his eyes but thought I noticed them in Liebert’s interpretation. Illes is excellent displaying razor sharp humor as Golde and is a perfect counterbalance to the more laidback Tevye. Skybell could not be better as the engaging milkman. He captures Tevye's puckish charm and comic moments along with the fierceness of his dedication in his beliefs. He superbly nails every emotion that book writer Joseph Stein has created in this character. 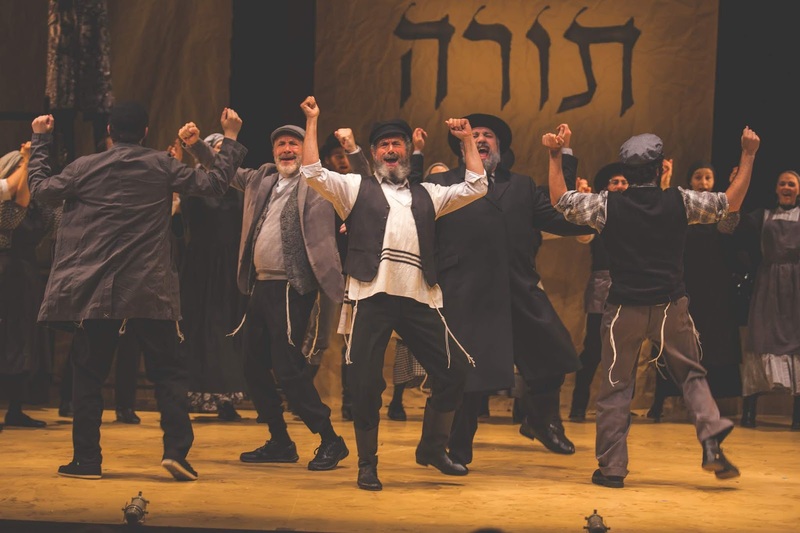 The score by Jerry Bock and Sheldon Harnick still reigns supreme in the musical theater world and here a number of the lyrics are more faithful to Sholem Aleichem’s stories. You may think you know them by heart but there is a difference here. Stay Kmiec’s staging is filled with the necessary adrenaline and brings Jerome Robbins’ original breathtaking choreography vibrantly alive. Much praise surely goes to Joel Grey’s accomplished direction. It is a tightly directed show which adheres to the original production. Yet, in its own way it has a fresh incandescent feel thanks to both Grey and the cast. Thus far, this is easily the best show of the new theater season. Tickets are available at the Museum of Jewish Heritage Edmond J. Safra Plaza, 36 Battery Place or by calling 866.811.4100. The limited engagement as of this date ends August 26.